India has seen a significant growth in purchases made through mobile phones each year. The growing number of mobile phone applications has boosted this growth. 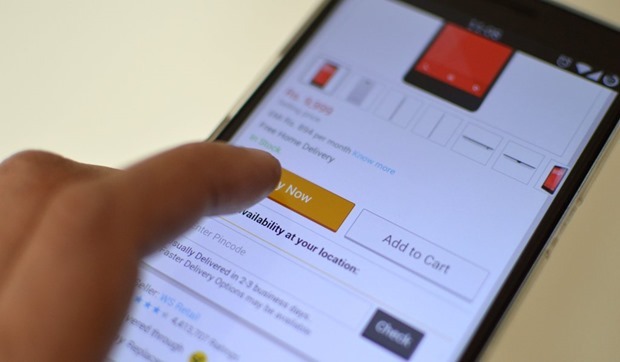 MasterCard Online Shopping Survey 2014, which covers 14 countries across Asia Pacific released on Wednesday, affirms the fact by revealing that purchases made through mobile phones in India have grown by more than 100 percent over the past two years indicating a steep upward trend in e-commerce propelled by expediency. The number of Indian respondents, who have made at least one purchase in the last three months, has increased from 70.9 percent in 2012 to 94 percent in 2014. The MasterCard Online Shopping Behaviour Survey, which was conducted between October and December 2014, is a benchmark measuring consumers’ propensity to shop online. China leads the chart with 70.1 percent poll respondents using mobiles to make online purchases. Followed by India at 62.9 percent, Taiwan at 62.6 percent, Thailand with 58.8 percent and Indonesia at 54.9 percent. The study papers also stated that the ability to shop on the go in India is 47.7 percent. Figures suggest that the growing availability of apps that makes it easier to shop (45.3 percent) and convenience (38.1 percent) drive mobile shopping. Mobile apps have also been at the top of the list when it comes to shopping done on smartphones. Other common purchases include movie tickets and clothing and fashion accessories. The report had 7000 respondents from age group of 18-64 stated. India ranks second with 81.2% of respondents accessing the internet for online shopping while China leads with 86.6%. “Digital payment solutions like mobile banking apps and digital wallets will go a long way to further enrich the purchasing experience for the ever-evolving consumer,” said Vikas Varma, area head, South Asia, MasterCard. “The survey shows that there is a strong need to provide not only secure, but also convenient payments solutions as consumers move to a more digital and sophisticated lifestyle. MasterCard is committed to providing consumers with expedient online payment solutions that enable a more seamless shopping experience in a secure manner,” he added. In the Indian market race, seven-year-old Flipkart is the most visited e-commerce website followed by Amazon, Snapdeal and Ebay by a very strong margin. Jabong and Myntra seem to yet be lagging behind in the race. #IndiasDaughter Youtube BBC Documentary Blocked On Govt Orders!